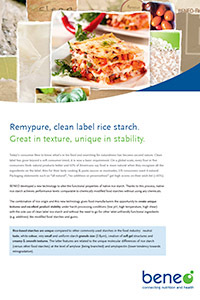 Remypure, functional clean label rice starch. Texture & stability in a natural way. Naturalness and transparency are key for today’s consumers. One of their greatest concerns relates to what they don’t understand or can’t see or taste, such as GMO’s. On a global scale, references such as “no artificial ingredients”, “no preservatives” and “contains only natural ingredients” score equally high on shoppers’ wish list as core drivers such as healthfulness and taste. 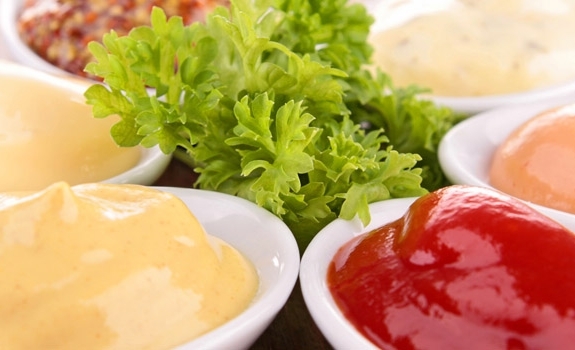 Clean label has moved beyond being a fad to a genuine trend. A new technology developed by BENEO lifts the functional properties of native rice starch to performance levels competing with those of chemically modified starches. 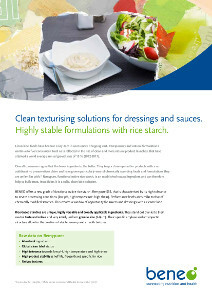 Adding to this the natural origin of rice, the creation of unique textures with excellent product stability can be formulated with one single starch. Avoiding modified or artificial ingredients, rice also withstands harsh processing conditions (low pH, high temperature, high shear). BENEO launches its second functional native rice starch, Remypure S52. 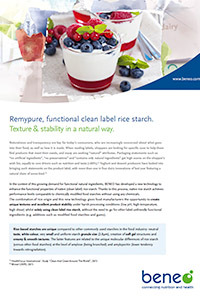 At this year’s Institute of Food Technologists Expo (IFT18) in Chicago BENEO launches its new Remypure S52 clean label rice starch which helps to create unique textures and excellent product stability even under harsh processing conditions. Natural has become almost synonymous to a healthy diet. As rice is widely perceived as a healthy, natural food that is nutritious and good for both adults and children alike, it perfectly fits the picture of the ever more natural food landscape. Let our experts walk you through the technical and physiological benefits of our ingredients, market insights, consumer concepts and recipes based on top-level food engineering. Get to know Remypure better.